Here are three excellent releases of guitar recitals mixing original compositions for guitar and some transcriptions. Two of the collections cover fairly similar, mainly Latin flavoured repertoire with some Mozart. The third collection on Warner for solo guitar, with two tracks with a string quartet and three with orchestral accompaniment, explores a much wider range of composers from J.S. Bach to John Brunning. 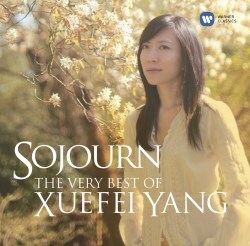 On Warner Classics Sojourn - The Very Best of Xuefei Yang is a 2013 compilation CD from this Beijing-born soloist who is now based in the U.K. After studying at the Beijing Central Conservatory of Music Xuefei studied at the Royal Academy of Music (RAM), its first Chinese student to be awarded a full scholarship. In 2012 Xuefei was made a fellow of the RAM. Making her first public appearance at the age of 10 she is an experienced performer on the international stage. The chosen works are a mix from previously released albums and 7 works new to CD. Bach’s enduringly popular Jesu, Joy of Man’s Desiring from the church cantata Herz und Mund Tat und Leben, BWV 147 is especially delightful, Tárrega’s Recuerdos de la Alhambra has never felt more evocative of the Granada palace and Albéniz’s Tango from his set España is vibrantly colourful. The famous slow movement from Rodrigo’s Concierto de Aranjuez is gloriously atmospheric and the immense appeal of John Brunning’s Sahara and Romance No. 1 is splendidly underlined. Eminently engaging this guitarist is able to convey real subtlety of colour and detail with a flawless virtuosity that feels effortless. 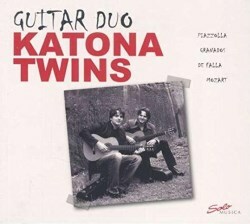 Issued in 2014 on Solo Musica the release from the Hungarian guitar duo identical twins Peter and Zoltán Katona is titled Guitar Duo - Katona Twins. Peter and Zoltán have undertaken considerable study at the Béla Bartók Conservatory of Music in Budapest, Academy of Music Kassel, Hochschule für Musik Frankfurt-am-Main Germany and RAM, London. Now German citizens, the twins live in Liverpool, England. The first album the twins recorded, Guitar Duo was produced in the winter of 1992 in a small Budapest church. The twins recall “It was a bitterly cold winter evening in Budapest and at first, we found even moving our fingers difficult. However just as we started recording the church warmed and it began to snow. Our fingers started moving and the large snowflakes muffled the outside noise.” Previously issued privately, now over 20 years later, this is the first time the album has been on general release, which accounts for its short playing time. The liner notes are rudimentary too. One certainly senses a special communication between the players in performances that feel spirited and lavish in panache. Especially impressive is the playing of the Piazzolla Tango Suite with all the bustling and vibrant atmosphere of sultry Buenos Aires cafés. Notable too is the work described as Mozart’s Serenade No. 4, K439b that I take to be the Divertimento No.4, K.439b. This displays the duo’s impeccable musicianship with considerable poetry as well as virtuosity. 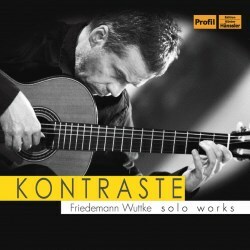 Titled Kontraste - Friedemann Wuttke - Solo Works this wonderfully played album is a 2015 release on Hänssler Profil. German soloist Friedemann Wuttke studied at the Musikhochschule Stuttgart and at the same time held a lectureship at Hochschule Ludwigsburg. Wuttke has issued a number of albums ranging from classic Spanish and South American music to collaborations with friends on the John Dowland album Shadows. On this release to increase the range of works as inferred in the title Kontraste ideally I would have liked the inclusion of some late twentieth-century music from say Hans Werner Henze maybe Oberon from his Royal Winter Music. Wuttke strikes me as a serious and perceptive performer and one feels his deep concentration in these interpretations. Thoroughly enjoyable are the four Mozart pieces “that derive from various works and have been adapted for the guitar”. These are characterful works and highly diverting. Worthy of praise too is the Villa-Lobos set Cinq préludes pour guitare all agreeably attractive. They draw inspiring playing of real accomplishment from Wuttke. Exceptionally well performed and recorded, all three releases would be delightful additions to a music collection. If I had to choose a single album on balance Sojourn - The Very Best of Xuefei Yang is the standout for its wider appeal and stunning performances.